When generous donors establish prizes for students they most often think of awarding meritorious graduating seniors. But a small group of donors have made the unusual choice of establishing endowed, annual cash prizes awarded during the fall semester to outstanding current engineering students. This year Jeffrey Tam, a mechanical engineering junior, won the Tyler Hicks Prize in Mechanical Engineering. Peter Wang, a civil engineering junior, received the John L. Alpert Prize. And Andrew Keane, a civil engineering sophomore, won the Maxwell Lincer Fellowship. Winners are selected by the academic leadership and the students each receive around $1000 to use in any way they see fit. Little-known among the students, the awards often come as a complete surprise to the winners. To bring the awards more attention we spoke with their donors. Tyler Hicks ME’48 gave us a first-person account of his path to The Cooper Union and his career afterward. Richard Lincer, chairman of the board of trustees of The Cooper Union, spoke about his father, Maxwell Lincer CE’42 and what the institution meant to him. Jane Alpert, the daughter of John Alpert ME’41, recalled his journey to the school of engineering and beyond. We also spoke with the students who received this year’s prizes. 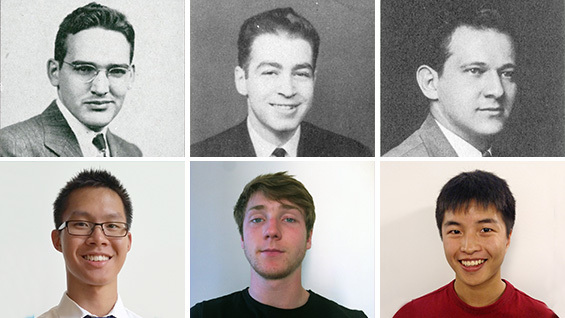 This way it became possible to see connections between past and present students of engineering, all of whom have been shaped by focusing on their passion at The Cooper Union. Tyler Hicks, 93 and living in Long Island, grew up in Manhattan and remembers how he discovered engineering at an early age. "When I was eight years old, the father of a friend of mine worked on the Staten Island ferry," he says. "One Saturday he took his son and me to the engine room. And I fell in love. Later I was in the Merchant Marine for eight years, in the engine room on 11 different ships. The chief engineer called me in one day and said to me, 'You ought to get off these rust buckets and go to engineering school.'" As it happened, Higby Young, head of the drawing department at The Cooper Union School of Engineering, owned the building where Mr. Hicks lived and encouraged him to apply. "I was 21 when I started at The Cooper Union," Mr. Hicks says. "I went at night for six years. During the summer I was in the Merchant Marine. During the school year I worked either at power plants in New York City or later on with a consulting engineering firm, working on the drafting boards." After graduating, Mr. Hicks began writing articles for magazines, often using pen names because he had so many in a single issue. This eventually led to being offered a job at publisher McGraw-Hill, where he spent 35 years as an acquisitions editor. He still works "seven days a week," he says. "I just had a 1200-page book come out. It's called Standard Handbook of Engineering Calculations, fifth edition.” He has authored over 100 other books on engineering and business and still publishes three newsletters. Mr. Hicks established the Tyler Hicks Prize in 1994, awarded to the top mechanical engineering student in the junior class. "I had to give back," Mr. Hicks says. "I had a great education at The Cooper Union." He made it a cash prize because, he says, "they say water is the universal solvent. That's all wrong. Money is the universal solvent. So I gave money." The 2014 winner of that prize, Jeffrey Tam, was born in Flushing, Queens, but grew up in Plainsboro, New Jersey. His interest in engineering began in high school when he took an AP physics class taught by an electrical engineer. "I got interested in physics and the way things work and why they are the way they are. I've always enjoyed math and I wanted to see how math applied to finding out the reasons why things are," Jeffrey says. He applied to The Cooper Union in the footsteps of his older brother, Andrew Tam CE'12. He wonders if, after he graduates, he might get into robotics, particularly the software involved. "Being able to type up some code, upload it to an Arduino microcontroller and make it work is something I find pretty cool.” When asked what he will do with the prize money he says, "I'll probably just save it for something in the future like grad school or textbooks." Maxwell Lincer grew up on the Lower East Side and in Brooklyn. He got interested in engineering through a childhood friend. "But he was poor," Richard Lincer says. "He was accepted to City College but would have had to quit his day job in order to go to school. So he heard about The Cooper Union and the night school. He decided to apply and was able to go there nights. That was tremendously important to him, being able to go nights." After graduating, Maxwell Lincer joined a structural engineering firm that eventually evolved into Leichtman and Lincer. "They used to work with a lot of Emory Roth buildings and the Rudins," Richard Lincer says. "They actually won an award for One Astor Plaza at 44th and Broadway because it's an office building with the Minskoff Theater on the ground floor. So you have a 150-foot clear span under a 44-story office building." In the latter part of his career Maxwell Lincer became the go-to structural engineering consultant for Broadway. "So when they raise the proscenium arch in the Majestic Theater for Phantom of the Opera and the chandelier swings, he did that. The New York Times Magazine even did an article about it." Richard Lincer and his brother established the Maxwell Lincer Fellowship in 1997 as a memorial. "We knew what Cooper had meant for him in his ability to go to school and what he was then able to afford us by me going to law school and my brother going to med school. And we thought this would be a nice way to honor him and 'pay it forward' to other students." The 2014 Fellowship went to Andrew Keane, born and raised in Northern New Jersey. "In high school I took a computer-aided design course that gave me an idea that I might be interested in engineering," Andrew says. "I was always a good math student. But it was that one teacher in high school who really directed me." Like Jeffrey Tam, he also followed an older sibling to The Cooper Union: his sister, Valerie Keane A'11. The Lincer award goes to an engineering sophomore or junior based on their prior year's academic record. During his freshman year Andrew maintained a perfect GPA. How did he do it? "With a lot of help from other people," he says. "I am on two sports teams currently: the basketball team and the soccer team. Being on those teams gives you access to all these upperclassmen who have been through all the classes." He hasn't really considered what to do with the prize money yet and finds it hard to identify where he might be in five years or more. "I still have a lot more learning to do over the next two and a half years," he says. The third prize has an unexpected focus on rewarding engineering students who demonstrate skills in the humanities and is awarded by the Faculty of Humanities and Social Sciences. John Alpert was born in the Lower East Side in 1916 but grew up in Brooklyn. "He and his older brother and sister were all excellent students and diligent about finding ways to go to college despite very limited financial resources," Jane Alpert wrote in an email. "Cooper Union was well known for its quality education, its free-tuition policy, and its night school that made it possible for students to earn a living while pursuing a degree. John was delighted and honored to pass the entrance exam and become a Cooper Union engineer." In 1960 John Alpert partnered with classmate Louis Brooks ME'41 to form Air Techniques, manufacturing air compressors and related dental equipment in Hicksville, Long Island. "As vice president of the company, John managed the marketing effort and the sales force," Ms. Alpert writes. "He traveled around the U.S. and built its reputation for customer-focused service and unquestioned integrity." After John Alpert died in 1986 his widow, Corrinne, sought to make a gift to The Cooper Union that would honor his memory in perpetuity. She chose to focus on building and honoring the humanities program for engineering students. "My father believed that engineers, to be successful, needed not only technical competence and analytic skills, but also what the humanities teach best: good judgment, clarity of expression, compassion and empathy," Ms. Alpert wrote. "The Alpert Endowment today supports both a professional Writing Fellow in the Writing Center and an annual cash prize of $1000 to an engineering student of exceptional achievement in the humanities. Its purpose is to encourage and reward young engineers to develop their gifts in language as well as technical skill and to cultivate a broad perspective that will serve them well in all aspects of their lives." This year that deserving young engineer is Peter Wang. A child of Taiwanese parents but born and raised in Chatham, New Jersey, he grew up liking math and discovered civil engineering through his godfather. "I thought about what profession I could pursue that would allow me to serve other people on a large scale or in a very concrete way," Peter says. "I thought about creating big transportation structures so I could be part of a service profession." "In high school I didn't like to specialize in one subject. I liked reading and writing. My senior year helped me be less timid in my writing and have more confidence in my own style." Peter continues his eclectic interests at The Cooper Union, for example by joining the musical theater club with no prior experience. He appears in this semester’s production of The Drowsy Chaperone. "The opportunities here are pretty awesome," he says. "A lot of people who haven't done things in high school get to start here because it's more inclusive. Anyone can join and anyone can get better at things." Tyler Hicks, Maxwell Lincer and John Alpert are separated from Jeffrey Tam, Andrew Keane and Peter Wang by a stretch of time. But they are connected not only through their love of engineering and the school they all attended, but also by generous gifts that echo Peter Cooper's original investment in future generations of engineers, artists and architects.